One of the best things about Grand Lake is the ability to maintain your shoreline and have a private dock. And that’s why you want to make sure you’ve got a reliable dock construction and repair contractor ready to help you when you need it. There is little better when it comes to lake living than having your own private dock where your boat is secure, the family can swim and play and it’s all yours. And one of the realities of having a private dock is the burden of maintenance and repair that comes with it. Here you will find Grand Lake dock builders that can help you will all of your dock needs. Arrow Docks, LLC provides custom boat docks for commercial and residential use. We offer full service design, engineering, fabrication, and installation of our products, as well as working with General Contractors for large construction projects. Arrow Docks entered the market using fresh, new ideas. Boat docks shouldn’t be boring. We add new designs, new materials, new colors, and make your dock a place you want to be, not just a place to store your boat. We also design and build breakwaters and ramps. Call today to see how we can help you with your dock needs. I’m Bill Morgan, owner of Grand Lake Dock, LLC., which I founded 8 years ago. I have more than 20 years of experience in dock building and have never had a dock go down. I would love to be your dock builder, but I urge you to see others first. Look over their dock construction and get their prices. Then come by and see me. Let’s compare apples to apples. I’ll show you how our docks are built better than any others and usually for the same price. Give me a call today at (479) 633-1356 or visit my website at https://grandlakedock.com to learn more about out products and how our docks can help you enjoy your time on the lake. Superior Docks and Lifts builds docks in sections using ‘truss frames’ and are assembled at our facility and then floated to your Grand Lake location. The metal frames are fully galvanized for long life with each section bolted together using ‘stainless steel’ fasteners. These docks are built to last! Decking Materials can be concrete, composite, or treated lumber – whatever you choose. We also manufacture boat lifts with 4,000 lb; 6,500 lb; and 9,500 lb capacities. The polyethelene tanks we build come with a lifetime warranty to the original purchaser. Give us a call today at (918) 676-3555 or call Roger on his cell at (918) 541-0993. 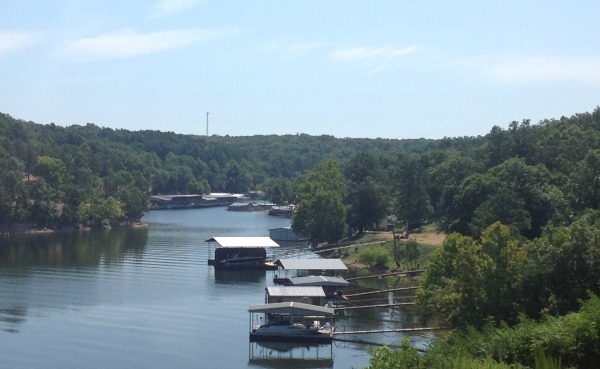 Naturally there are rules and regulations when it comes to private docks on Grand Lake. For everything related to that, it’s best to go straight to the source. The Grand River Dam Authority. You can visit their website at www.grda.com or call the GRDA Office of Ecosystems Management at (918) 782-4726 to get your dock questions answered. Many times when you buy lakefront real estate at Grand Lake there will already be a dock attached to the property. If that is the case you need to make sure to contact GRDA to transfer the permit for that dock. If you are working with a real estate agent or broker they will surely help you with that…but ultimately it is up to you. And once it’s yours…it’s yours! And with that comes the responsibility to keep it safe, up to code and ready for your use throughout your time at the lake. Whether you are ready to build a brand new, custom boat dock for your Grand Lake waterfront or are looking for a dock repair companies, the above Grand Lake dock construction and repair companies are the best place to start. And don’t forget to visit this page: Featured Grand Lake Contractors, if you need other things done around your place.